Several specifications stated last Fall were adapted. Next to the range, the price was also adjusted from the originally 2,990 euro plus 490 per battery module, customers will now have to pay 3,399 plus 699 euros per battery module. The first module is included in the base price, at least. The vehicle can carry up to three battery modules, with 1155 Wh each. With an average speed of 20 km/h, the batteries last up to 80 km for a maximum range of 240 km. The choice of motor power is also open to customers: There are motors in both 2 and 7 kW, which allow for speeds from 25 to 95 km/h. The scooters are also fitted with a 7 inch display. 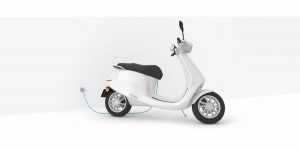 The manufacturers are very proud of the network connections integrated in the scooters, as well as a 60 litre storage space. The company has begun accepting pre-orders for the electric scooter. Deliveries will then follow in the next year, while smaller motors will be rolled out first. The following video shows their Amsterdam presentation.